...was a full blooded Navajo orignally from Chinle, Arizona. Born in a small stone house in 1907, Carl was the oldest of six children to Nelson and Alice Gorman. He attended Albuquerque Indian School and graduated in 1927. Gorman was one of the Original Twenty-nine Navajo Code Talkers of World War II. The First Twenty-nine was the initial group recruited by the US Marine Corps in 1942 as the pilot of Navajo men to test the feasibility of using the Navajo Language for combat communications. They became Platoon 382, the first all-Indian, all-Navajo platoon in Marine Corps history. Upon graduation they developed the initial Navajo code of a little over 200 terms, including the English alphabet. In July 2001, the First Twenty-nine Navajo Code Talkers were awarded the Congressional Gold Medal in Washington, DC. Carl's wife, Mary Gorman, received the medal in his memory. After World War II, Gorman became an outstanding artist who broke the mold in Indian art. In fact, Carl attended Otis Art Institute in Los Angeles, California on his GI Bill where he formally studied the masters of Europe. Never forgetting who he was - a Navajo with a proud history and tradition - Carl was not afraid to experiment with the raw power and imagery of his traditional Navajo world combined with the "refined and proper" world of western art. He refused to be boxed into the stereotypical version of Indian art which was flat and two dimensional. Consequently, he experimented with paintings and various techniques as well as with other mediums such as ceramics, tile, silk screening, and jewelry design. He opened doors for many Indian artists including his world-renowned son, RC Gorman. Throughout Gorman's life he continued to paint. However, his interest in his Navajo culture led him into positions that ranged from managing the Navajo Arts & Craft Guild in the 1960s, to serving as the Director of the Native Healing Sciences with the Navajo Nation in the late 1970s. Between 1969 and 1973, Gorman was a professor at the University of California - Davis where he was one of the four founding faculty of the Native American Studies Department. In fact, after constantly displaying his student's work in his office, UC Davis dedicated and opened the C. N. Gorman Museum in 1974 in his honor to continue Gorman's encouragement of young artists. Gorman received an honorary doctorate in Humane Letters from The University of New Mexico in 1990 for his life long work and achievements in Indian art, Education and culture. Gorman died at the age of 90 in January 1998. 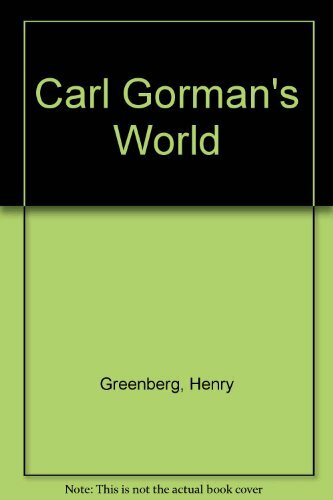 To learn more about Dr. Carl N. Gorman, the Gorman family recommends reading his biography written by Henry and Georgia Greenberg. 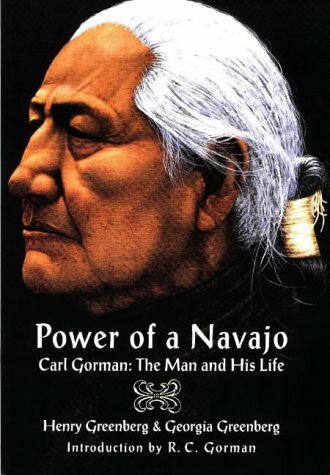 Originally published as Carl Gorman's World, it was republished as Power of a Navajo and can still be bought on Amazon, or rented at your local library - it's usually a special collections book and cannot be read outside the library. Both titles are out of print but are available for sale on Amazon (Link provided below). Also, be sure to get the two posters for sale depicting Navajo Code Talkers sending and receiving messages by Dr. Carl N. Gorman. These posters were produced from his original artwork in memoriam to honor Dr. Carl N. Gorman's legacy both as an artist and a Navajo Code Talker. These posters are sold exclusively at ZonnieGorman.com and are a perfect addition to your Navajo Code Talker collection, or to your Gorman art collection. So get yours today!